30 Minute Meals for the Paleo AIP! Zucchini as an oatmeal substitute? Nah. That was my thinking, anyway, when I first heard of it. Sure, I’d embraced organ meats, sardines, previously unknown veggies like celeriac and parsnips…but zucchini for breakfast? No thank you! But – and I love this – we are not only allowed to change, it is actually a beautiful thing, and part of life’s natural cycle. And so, today, I have eaten, and greatly enjoyed, zucchini as an oatmeal sub! Zucchini, it turns out, is a great vehicle for oatmeal when used in conjunction with other ingredients to thicken and bind. Here, that means shredded coconut, apple sauce and a dash of date syrup (for added sweetness) and gelatin. Warm, slightly sweet, thick and creamy…mmm. Personally, no matter the weather, I enjoy warm foods. Always have. You’re much more likely to find me with a hot cup of tea in hand than iced java. And hot “noatmeal” for breakfast, especially one heaped with nutrition, leaves me feeling full and satisfied. You may think you know zucchini. You may think zucchini has primarily one form, the ubiquitous “zoodle”. But this “noatmeal” will have you looking at it in a fresh light. Here, it softens, yet provides a bit of bulk that the coconut and blueberries build upon. Berries here means you can swap the blueberries for strawberries, or even a combination of the two. Heck, you could certainly swap the berries for another fruit entirely: cherries or peaches both sound appealing. You will need to set aside any expectations for that off-white color normally associated with oatmeal. No such color exists here. Zucchini, blueberries, date syrup, all on the darker end of the color spectrum, means you should expect a noatmeal of a darker hue. If you’re looking for a brighter color, top with color! Berries or other fruits will brighten here, as will a drizzle of coconut manna. Which I highly recommend, anyway. Enjoy this Zucchini Berry “Noatmeal” Breakfast Bowl! #letscreatethesweetlife if you make this recipe – we love nothing more than seeing you enjoy these recipes!! This recipe is part of Phoenix Helix’s Recipe Roundtable #227. 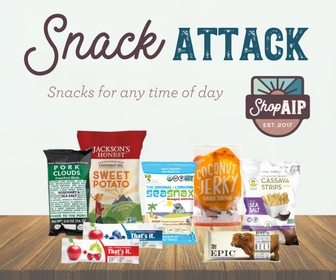 Be prepared for an explosion of creative and delicious, all-AIP recipes!! This simple "noatmeal" features zucchini, berries and coconut. Perfect warm bowl for when you're craving oatmeal! Has the thick, chunky texture of oatmeal but is grain and nut free. Shred your zucchini and, using a nut-milk bag or clean towel, squeeze out excess moisture. A small but important step! Add all ingredients except for gelatin to small pot. Cook over medium-high heat until bubbling; reduce to low and simmer for ~10 minutes. Add gelatin and stir to combine, then continue to cook for several minutes more. Eat immediately. Serve topped with additional blueberries, a drizzle of coconut manna, or nuts if reintroduced / tolerated. Enjoy!! Venison “Hamburger Helper” + NEW Cookbook!